Precision Ground Flatstones are ground on both faces with a diamond wheel. the long sides are ground perpendicular to the faces. 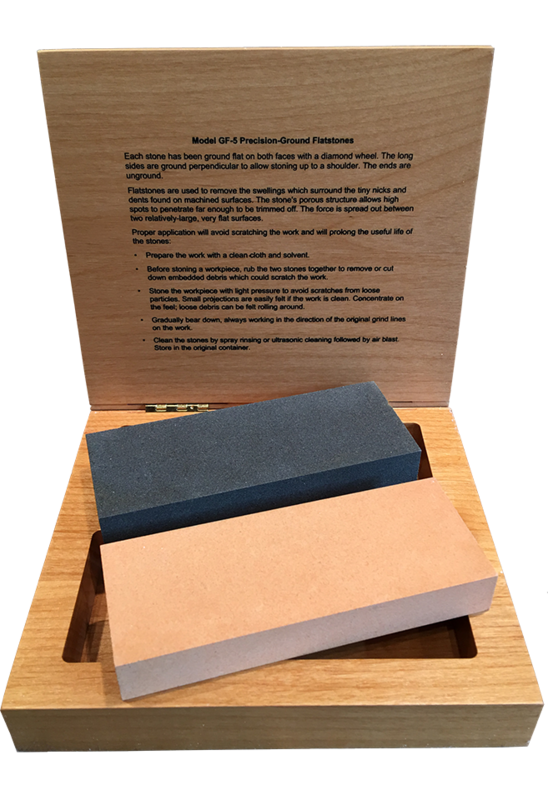 Use these flatstones to improve precision ground surfaces or repair surfaces by removing swelling, dents and nicks. The stone’s porous structure allows asperities to penetrate far enough to be trimmed off. When the raised area is reduced in height to about ten microinches, the force is spread out between two relatively large flat surfaces, and cutting activity substantially stops. Proper application will avoid scratching the work and will prolong the useful life of the stone:. Prepare the work by locally removing large burrs with a file or an unground stone. Clean with solvent and tissue. 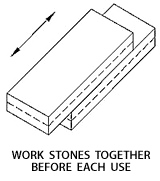 Before stoning a workpiece, rub the two stones together to remove or cut down embedded debris which could scratch the work. Slide the stones onto the workpiece with light pressure to avoid scratches from loose particles. Small projections are easily felt if the work is clean. Concentrate on the feel; loose debris can be felt rolling around. Stop immediately and reclean. Gradually bear down, always working in the direction of the original grind lines on the work. Clean the stones by spray rinsing or ultrasonic cleaning followed by air blast. Store in the original container to avoid misuse on rough work. To read more about the benefits of adding Precision Ground Flatstones to your toolbox, click here.